SEOUL, Korea, Republic Of -- Imprisoned former South Korean President Park Geun-hye has requested a temporarily release so she can be treated for health problems her lawyer says are causing "burning" and "cutting" pain, prosecutors said Wednesday. An official from the Seoul Central District Prosecutors' Office said it will soon review Park's request. He spoke on condition of anonymity, citing office rules against speaking to the media. Park's lawyer said she has been dealing with disk problems in her neck and back that are causing intense pain and sleeping problems, the prosecution official said. 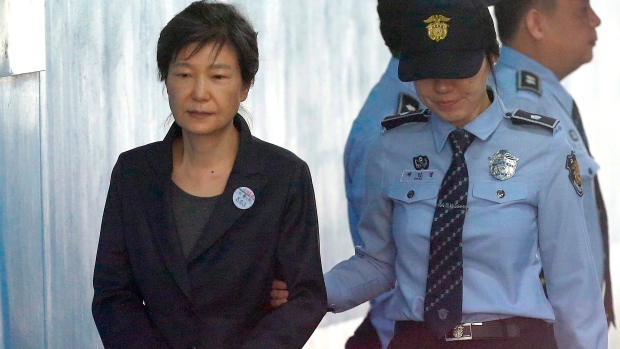 Yoo Young-ha, Park's lawyer, did not immediately return calls for comment. South Korean criminal law allows prisoners with serious health problems to be treated at hospitals under the eye of prosecutors before returning to prison after recovery.